Turn 4 is uninteresting. My weakened expansion army ends up dying to the province with 10 men because they had a priest. I end up using the scout I recruited last turn to start building my fort, and use my priest to build a temple since I have enough for it. 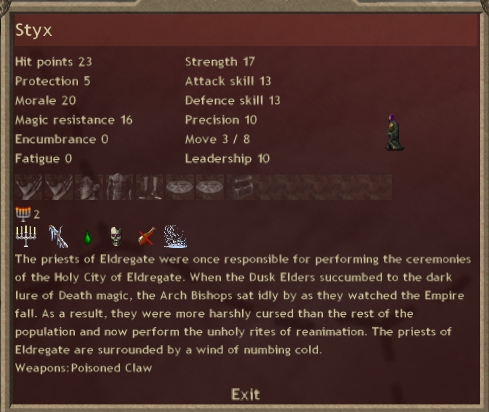 I use my newly revived dusk elder to go lead my army from my capital. The event is some water gems, but thats not important. 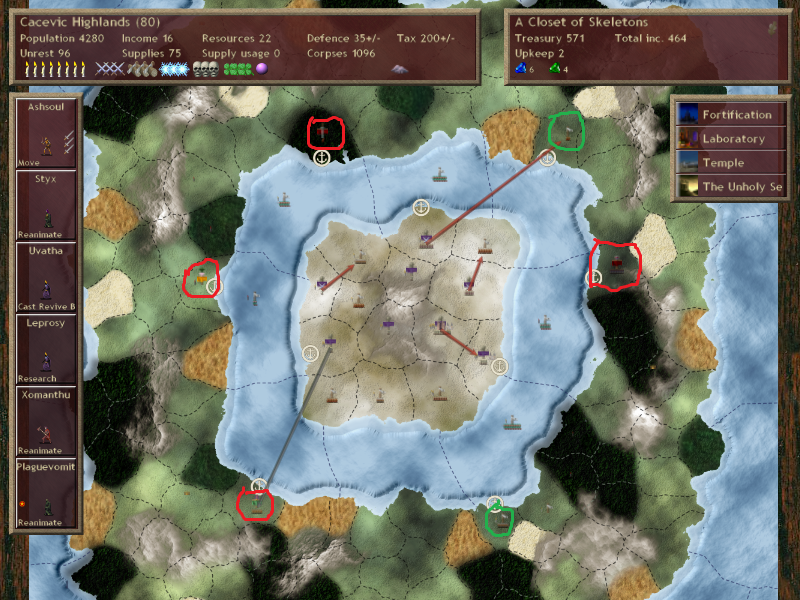 I had two battle reports from a province I attacked this turn. That means someone wins the award for quickest to invade my island. The first battle was my lich beating up the independents. The second, I am greeted by this. Mictlan decided to beeline for my island. In my opinion, this is actually an incredibly smart idea. Mictlan has a lot of potential to kill me right away in the early game. If another player or two make this same decision as Mictlan I would likely be sunk. I dont have the freespawn power this early to really hold back some aggressive early attacks. Of course it wouldnt be Mictlan without a blessing. This bless confused me a little bit, but it made more sense after I found out that its chassis was a giant head*. Its a W9N4B4 blessing, the W9 is the really significant component. The quickness and def +4 helps Mictlans Jaguars be very effective against my freespawn. Ive talked about how Im not a big fan of W9 Mictlan because Jaguars are fairly squishy and expendable, so you should focus on an offensive bless. However, this bless gives Mictlan the potential for his jaguars the potential to plow through my freespawn with minimal losses, and provide extra survivable meat shields for his priests to banish spam me to death. The biggest problem in this case is that A Closet of Skeletons will be very, very hard for jaguars to kill. Jaguars have trouble killing high protection units (Ermor doesnt have many) because of their low max damage threshold without an offensive bless. The B4 will help a little bit with that, but jaguars will have a hard time getting through my pretender gods 20 protection and awe to kill me. Its a good bless to fight my armies, not a good one to kill my god. If he had an F9 bless he would tear through A Closet of Skeletons. *For reference, the giant head is a god that starts with N4B4 and high dominion base. So thats where the N4B4 part of the blessing is coming from. The reason it was confusing me at first was I didnt think of it as a giant head blessing, I figured he had a dragon (for the W3) so the N4 made absolutely no sense to me. Its just not a good bless for jaguars and doesnt do anything for him in terms of path diversity. A Closet of Skeletons ends up winning the battle. The enemies flee before his might! (Lets not mention that I had 1 hp left at the end, and this easily could have gone either way.) The real damage dealer in this case wasnt actually any of Mictlans troops. They did do damage, just it was in small amounts. His prophet was casting smite at me the entire time, and when it hit it did damage in the range of ~20, which was about a fourth of my health each shot, quite painful. With the leader of Mictlans troops dead and most of his army routed, I have at least one turn, maybe even 2 before Mictlan can try to assault my island again. 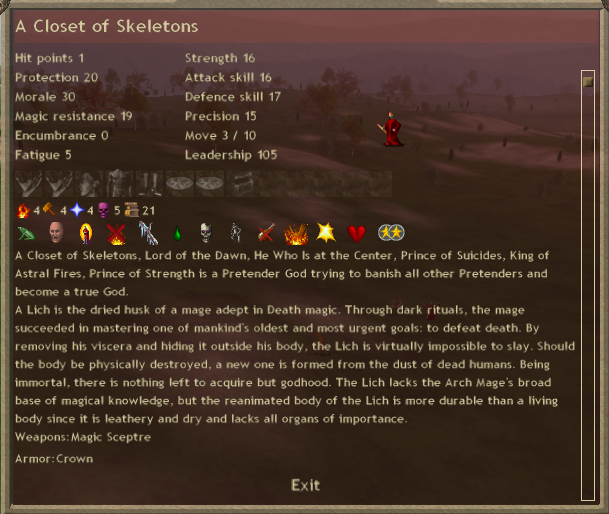 So I send A Closet of Skeletons to continue expanding on my island so I can start spawning more troops. Otherwise I continue expanding with my other armies. 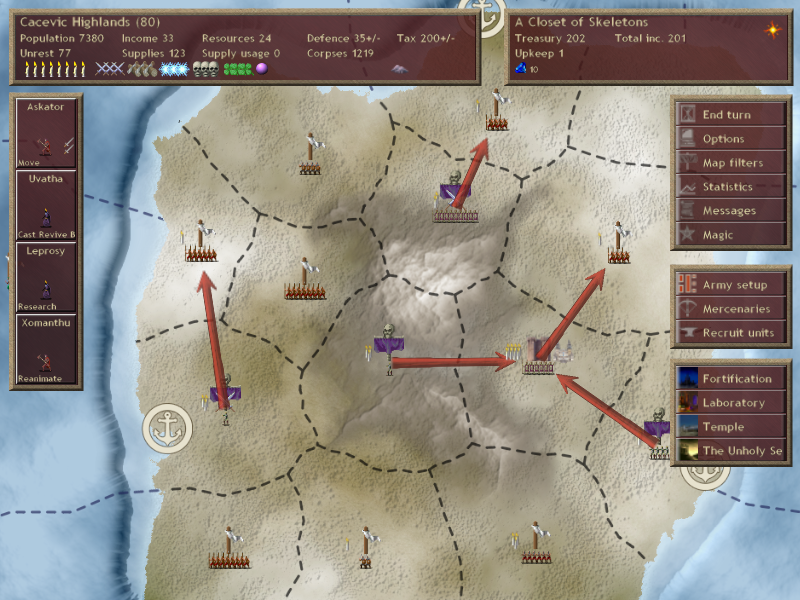 There are no unexpected battles this turn, and none of my expansion armies lose, so good news all around! I also got a few free nature gems from an event. 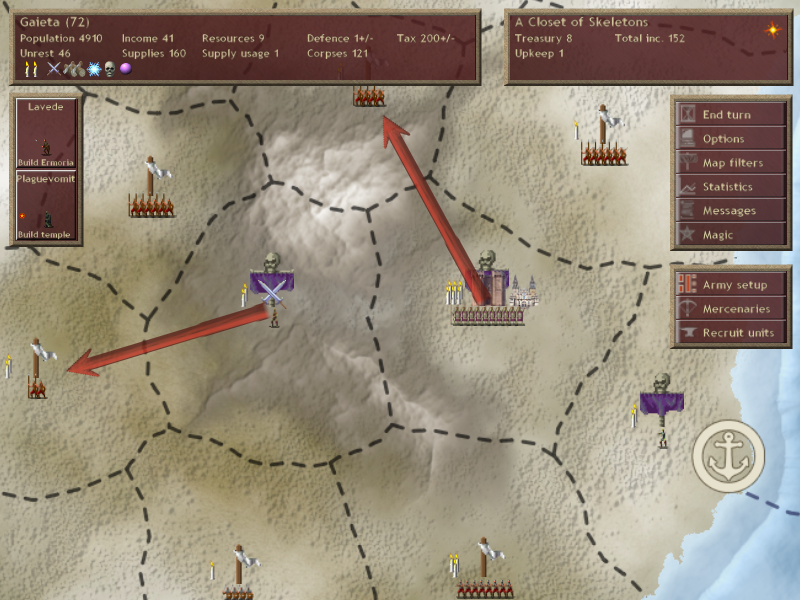 Mictlan hasnt move a new commander with extra troops on my border so I have some more time to expand. However, my options for expanding off of the island are quickly running out. Midgard, Bogarus, Mictlan, and Patala have all already claimed ports, and I only have two independent options for leaving the island left. 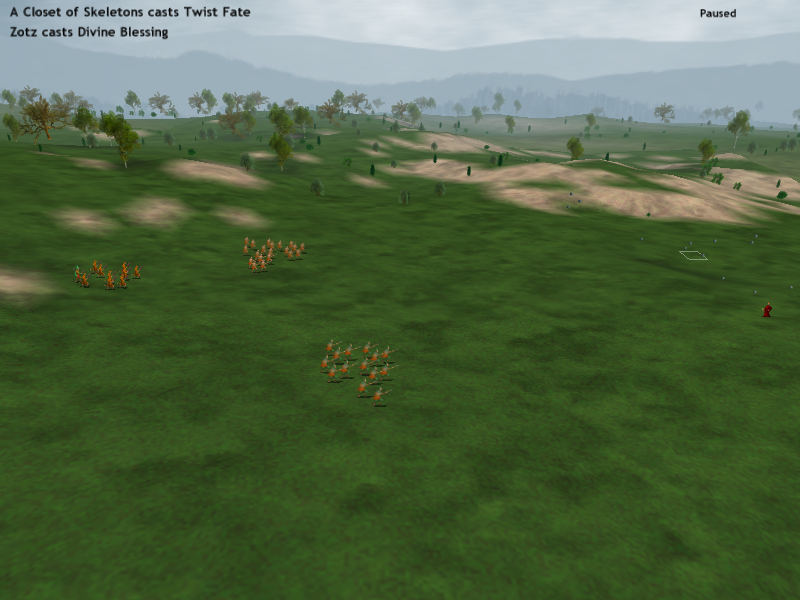 I decide to send troops in those directions immediately to try and waste some populations before others move in. Additionally, I decided against reviving another dusk elder this turn. Instead I used my mage to Summon a bishop, an H2 priest who will spend the rest of eternity reviving longdead horsemen nonstop. I plan on summoning a /lot/ of these guys, as even if I spend all of my gems reviving mages, my research will be pitifully behind people, and I will need all the troops I can get to survive.